The following is a sponsored review written by Mark. All opinions are his own. Accor Hotels is a luxury accommodation group of over 4,000 hotels spanning 90 different countries, representing a range of top hotel chains such as Sofitel, Pullman, and Novotel. The Australian branch of Accor Hotels covers a great range of accommodation options all the way from Western Australia to New South Wales. One thing I like about the website is that it's clean, with not a lot of clutter, making it easier and less of a hassle to navigate than many other hotel booking websites. The homepage includes just a single, simple navigation bar at the top, a search box to the left, and a number of popular destinations and featured hotels in the body section. The first option for searching for a hotel is the box on the left hand side where you can enter your destination, dates, and the amount of nights you wish to stay, in order to do a quick search of what's available. For browsing hotels there are two main ways: by hotel brand name (such as Sofitel or Ibis Hotel), or by location (Brisbane, Queensland or Hobart, Tasmania). Overall, I prefer searching by location, an option that allows you to focus in on exactly where you're going in Australia and then compare your options of what hotel brands are available in that area. 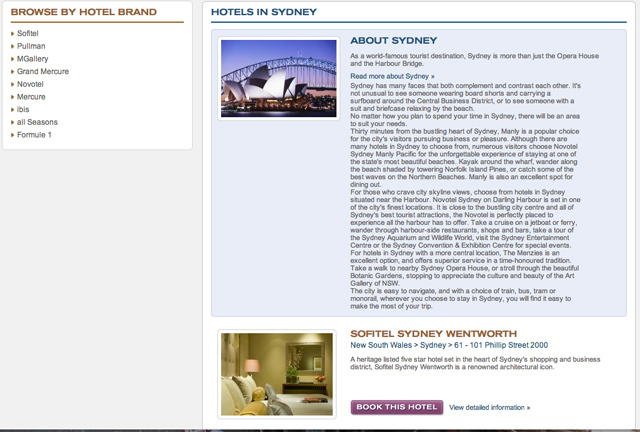 For instance, if you hover over the “Hotel Locations” tab, go down to “New South Wales,” and then click on Sydney, you'll be presented with a nice list of Accor hotels in Sydney (including a variety of different branded hotels). You can get even more specific by location (depending on how large the city is) by clicking on a location like Sydney Harbour or Sydney Olympic Park which present less options, but a more refined location. Again, like I mentioned above, the design and functionality of the site are right on. Searching by either hotel or brand name makes booking a hotel of your choice effective and hassle free. Also, after choosing either hotel brand or location, the top listing is always a description of your particular search. From the “Accor Hotels” tab, click on Sofitel, and directly above the accommodation listings you'll find a nice description regarding the property and all the amenities they have to offer. Likewise, if you search a location like hotels in Bondi Beach, you'll find a brief, but helpful excerpt about the area including attractions and highlights. After deciding on a suitable hotel, you can then choose your personalized options (like dates and room size), and you'll be presented with a price that already includes taxes. From there it's easy to make a booking if you so desire. Customer service is also a standout feature. You can easily click on the contact link at the bottom of the website, or just give Accor Hotels a call via their toll free phone number, which is prominently displayed at the top of the website. Once you click on a hotel to view the booking deal, the top navigation bar and the footer rearranges (taking you to the main Accor website instead of remaining within the Australia branch), making it a little confusing. Both user reviews and more, larger-sized, photos of each hotel are a few things I thought could use improvement. Nowadays, user reviews are essential when booking hotels online, and I would assume many people, after finding a suitable hotel on the Accor Hotels website, would then do an online search for it again to see what peers have personally said about it. 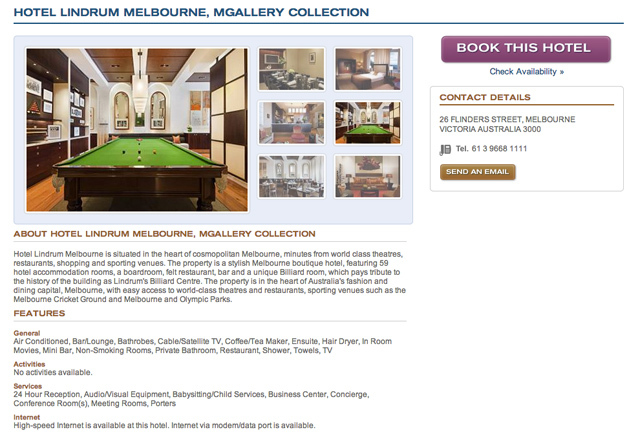 The hotel photo galleries are also not overly attractive, each hotel only includes a few small images. Users want to be impressed by the photos – those are the first mental images of a hotel – the pictures make a hotel appealing, and large high-quality photos are helpful in making accommodation decisions. 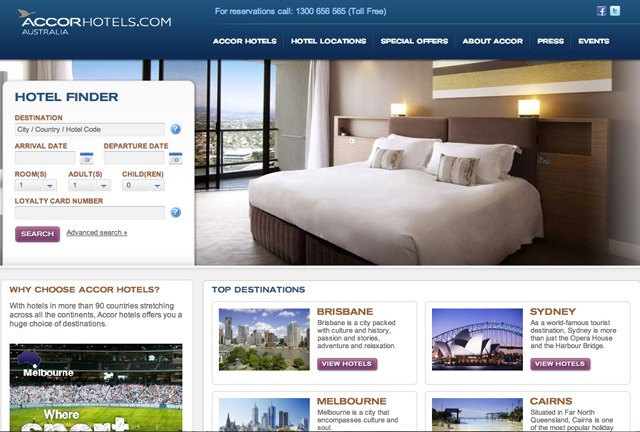 Accor Hotels Australia is a convenient search tool and booking agent for arranging luxury accommodation in Australia. You'll find competitive rates and a number of special offer deals as well. With a few small improvements I think the site could be better, but overall, it is nicely designed, simple to navigate, and easy to make a booking.